Nestled in the woods on Little Crow Point, rests this quintessential Maine cottage with beautiful views of Wills Cove and Casco Bay. Offering a comfortable, country cottage interior, a spacious screened porch, ocean views from every room, and water access, "On Wills Cove" will beckon you back for years to come. Inside the cottage you will find an open concept kitchen, living, and dining area with cathedral ceilings, offering a spacious and sunlit area to relax and enjoy one another's company and a propane stove to gather around on those chilly Autumn nights. The fully stocked kitchen opens to a screened porch with a dining area to enjoy a lobster feast with an amazing view. There are two formal bedrooms on the first floor, one with a king and the other with a queen, both offering their own bathrooms, and there is a twin trundle bed in the loft area. The home is equipped with heat pumps, offering A/C and heat. Perfectly set on a private road in the coveted Long Point neighborhood, you will enjoy peace and quiet and great morning and afternoon walks, while being just 10-15 minutes from all the amenities of Brunswick and the Harpswell Islands, offering many local restaurants, shops, and beaches. 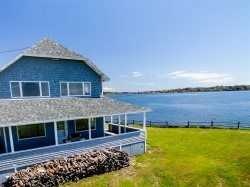 Come enjoy all that "On Wills Cove" and Harpswell have to offer, and I can assure you that this seaside retreat will call you back for year after year! Pets are welcome at On Wills Cove! On Wills Cove does offer access to the ocean, please swim at your own risk. Our stay at On Wills Cove was truly a dream. We couldnt have asked for a better family vacation. It was a cozy, comfortable and peaceful beach cottage with all the basic and extra amenities! We will definitely be back and probably for two weeks next time, once just wasnt enough. MaineStay was an incredible company to work with too. Very professional, efficient yet personable. I highly recommend using their services! This charming house is one of the prettiest on Great Island. Its view of the water is expansive and ever changing with the tides. Beautifully decorated and landscaped, On Will's Cove is a delight. Beautiful home, amazing views. Easy access to Maine Coastal Botanical Gardens, Topsham Fair, Maine State theatre, Seadogs baseball game.